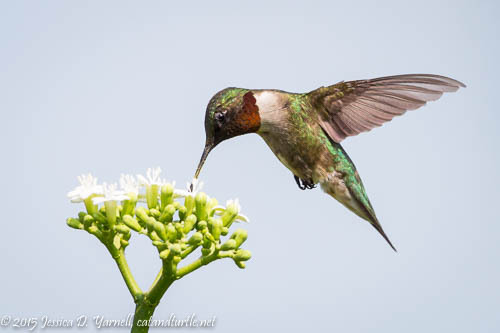 Blog > Beyond the Backyard > Fort De Soto > Ruby-throated Hummingbirds at Fort De Soto! 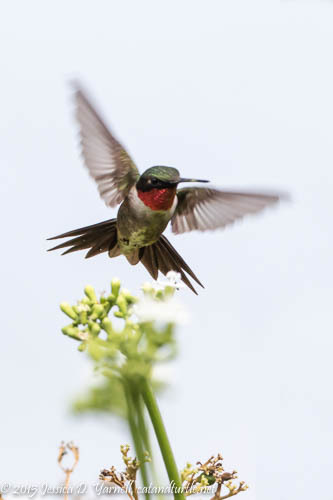 Each spring, tiny Ruby-throated Hummingbirds fly non-stop across the Gulf of Mexico as part of their yearly migration to their breeding grounds. It’s a daunting flight. They fuel up on extra nectar for weeks beforehand, storing fat reserves, which they consume on their 18-24 hour flight. There’s no place to land once they take off. So when they make it across the gulf, they are tired and hungry, and they land at the first location that they can – like Fort De Soto. 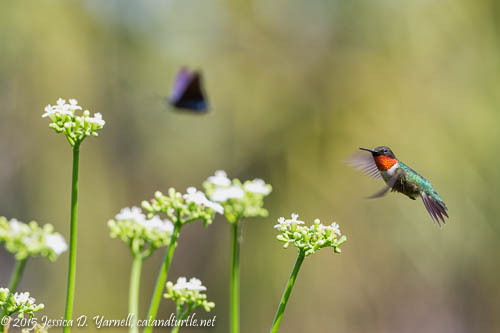 I observed several hummingbirds on my April visit, and it amazed me to watch them zip around, feeding ferociously. They had survived their long journey and they let me photograph them before they continued northward to their breeding grounds. 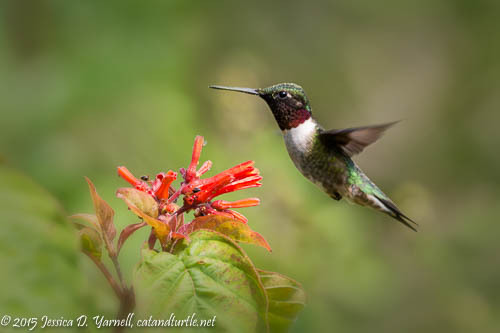 Ruby-throated Hummingbird – one of the few times the male showed me his red throat! I found three hummingbirds fighting over a single flower in the East Beach woods. 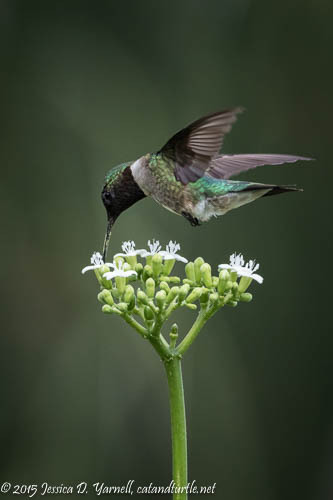 While I often associate hummingbirds with butterfly gardens laden with nectar, these birds had found their sugar water in one of the nondescript beach flowers. The three birds shared the flower, with frequent chatters and scoldings as they each laid claim to their own parts. Then at the Mulberry Tree area, there was one very cooperative male Ruby-throated Hummingbird who captivated my attention for a good hour. (Hummers are some of my favorite birds. An hour passes quickly as you watch these little guys zip around!) He had claimed a bush of white flowers as his own private territory and he chased away all other visitors, including hummingbirds, butterflies, and bees. As there were many hungry butterflies that day, the hummer stayed busy defending his flowers. This little guy was hungry. He would fly to his flowers, nectar from them all, and then rest for a few minutes in the nearby firebush. Then he would fly out again, re-visit all the white flowers, and nectar some more. Occasionally he would check out the firebush blooms as well. It wasn’t often that I saw the bright red of his throat. If the sun isn’t hitting his gorget at just the right angle, his feathers appear to be black. But when the angle is perfect, the sun’s rays make his feathers glow a bright red. He flashed his throat at me while he sat resting on a flower. 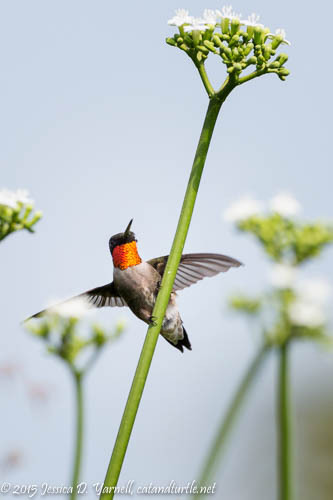 Ruby-throated Hummingbird – Look at that bright red throat! Sweet! What a nice treat! Great captures! Very nice timing/angle/luck/skill to show off that throat!